A club callout alert service to better inform students of upcoming events. Boiler Callouts was active during club callout seasons. 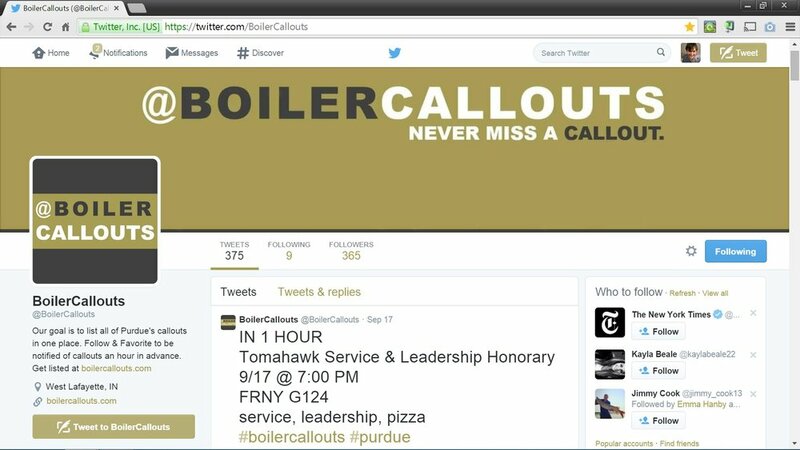 It allows clubs at Purdue to submit information through an online form and then, instantly, see their callout information listed on the Boiler Callouts twitter feed. The feed also tweets the information again an hour before the callout so that followers know about upcoming callouts. I developed all the code to support this fully automated system and built tools to help me collect club emails. I did all of the design work as well. It took just a few days to get everything working and clubs were more easily able to connect to the people interested in them. This project was purely for fun. The account quickly amassed over 350 followers and nearly 100 of the contacted clubs listed callout info.